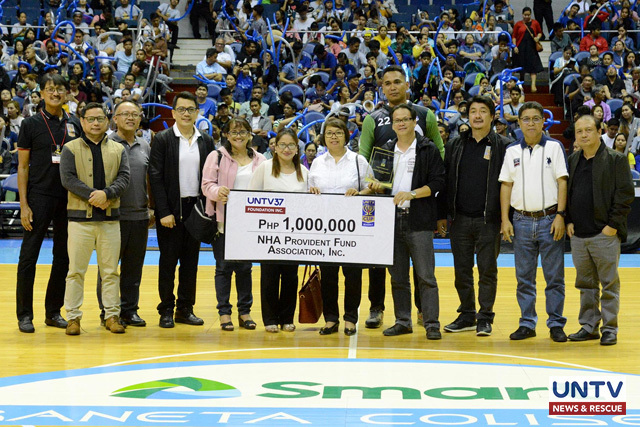 UNTV Cup Season 6 4th placer NHA Builders proved they are among the teams-to-beat after routing two-time champion Judiciary Magis, 73-68, in the charity tournament that is offering P4-million to the winning team’s chosen charity. The NHA needed a decisive run mid-way through the payoff period to surprise the Judiciary in their match at the Pasig City Sports Center on Sunday. The heroic moves of Marvin Mercado and Alvin Vitug led the Builders to beat the Magis by bucketing 22 and 18 points, respectively. “Sa darating namin na ensayo mag-ha-hard practice pa rin kami, saka yung depensa rin medyo nawala rin noong bandang huli,” Judiciary Magis coach Joey Yabut said. 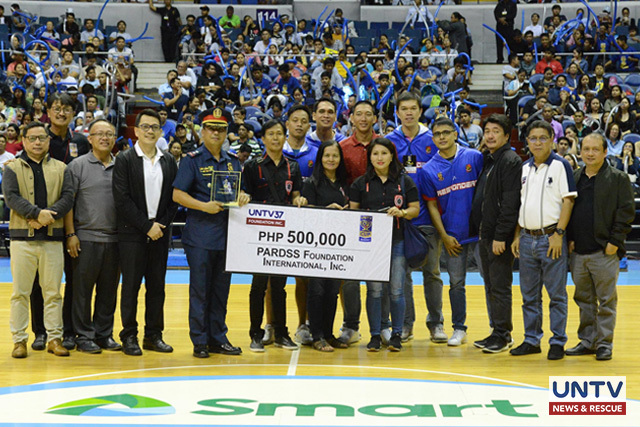 The AFP cavaliers, meanwhile, drew 26 points from former Letran star Boyet Bautista and waylaid the DOJ Justice Boosters, 109-87. 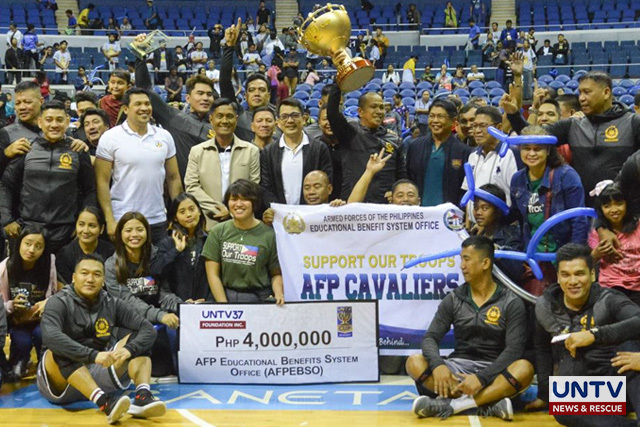 The AFP’s win put the Cavaliers in the same level with opening-day winner and defending champion Senate Defenders. “Hopefully, magtuloy-tuloy ngayon. Nadagdagan kami ng dalawang players, isang malaki saka isang medyo maliit. 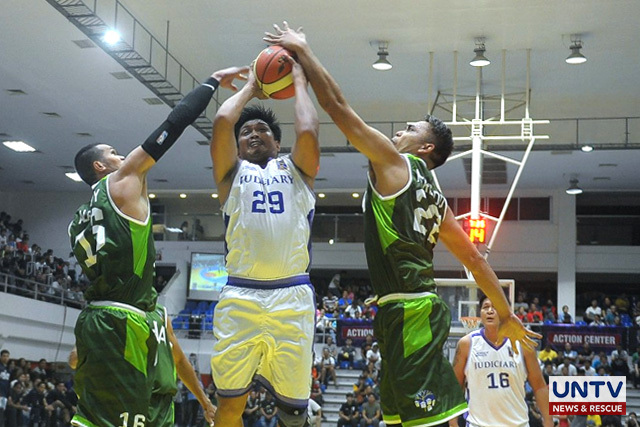 Basically, medyo bumata kami ngayon siguro makakasabay kami nang maayos ngayon,” AFP Cavaliers Head Coach Corporal Cornelio “Sonny” Manucat III said. Malacañang-PSC Kamao, meanwhile, dumped the Ombudsman Graft Busters, 101-72, despite the 25-points bucketed by the latter’s reinforcement player, Luis Palaganas Jr.
Eric dela Cuesta was hailed as the Best Player of the Game with 14 points, 6 rebounds, 2 assists and 4 steals. “Kailangan lang namin talaga i-solid yung depensa namin, saka yung mga lokal namin kailangang mag-step up… saka si Bernzon Franco hindi sya 100 percent kaya walang katulong si [ Luis ] Palaganas,” Ombudsman Graft Busters Coach Ricky Alcantara said. — Bernard Dadis | UNTV News & Rescue. GAME 1: AFP Cavaliers defeats DOJ Justice Boosters, 109-87. GAME 2: Malacañang-PSC Kamao defeats Ombudsman Graft Busters, 101-72. GAME 3: NHA Builders defeat Judiciary Magis, 73-68.